The position is magnificient: directly on the Lago Maggiore whose powerful wash of the waves untrained ears might mistake for the rush of the sea. And the absolutely clear and clean water makes bathing a temptation hard to resist. 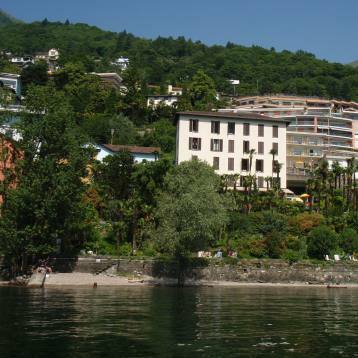 The terraced palm grove sloping down to the lake is one of the most beautiful of the whole “Verbano”. The house is personally run by the owner. Comfortable rooms with shower or bath. Abundant breakfast. Meadows for sunbathing.